There is a prominently held view that dissemination of renewable energy technology is marred by high costs. It's true that a few technologies like wind power have become cheaper, but others are still expensive. Solar photovoltaics (PV) and wind energy now cost one tenth of what they did in early 1980s. Today a wind energy plant costs just about the same as a coal-fired thermal power plant of the same capacity; it could be even cheaper at places with high wind speeds. The cost of biomass gasification and geothermal energy is going down too. Despite these developments, markets and economic policies worldwide still favour fossil fuel technologies. Subsidies given to fossil fuels are perhaps the single most important impediment against renewable energies. Government support for emergent energy technologies started with coal in the 1800s, first subsidised by the United Kingdom (UK) and then by other European countries. A century and more later, many European countries still subsidise their coal-mining sector. "Similar levels of government support have been found in subsequent energy transitions, including those driving oil and natural gas production and use, as well as nuclear power. Direct aid was not the only instrument. For many of these transitions, governments provided technical assistance, guaranteed the purchase of new technologies and paid for the research and development needed to overcome technical barriers to implementation," write Jonathan Pershing and Jim Mackenzie in Removing subsidies: Levelling the playing field for renewable energy technologies, prepared for the International Conference for Renewable Energies to be held in June 2004 at Germany. "The result of historic -- and ongoing -- government subsidies has been to skew the playing field against 'clean' sources of energy," says the paper. Governments gave subsidies worth US $250 billion to US $300 billion to fossil fuels in the 1990s each year, says an assessment by the United Nations Development Programme. As a mid-1990s paper of the US Congressional Research Service says: since the "great bulk of incentives support mature fossil and nuclear equipment, the existing subsidy structure markedly distorts the marketplace for energy in a direction away from renewables." According to the US non-governmental organisation, Green Scissors Campaign, between 1948 and 1998, the US government spent US $111.5 billion on energy research and development programmes. As much as 60 per cent, or US $66 billion, of this amount was spent on nuclear energy research and US $23 billion on fossil fuel research. "In all OECD (Organisation for Economic Cooperation and Development) countries, 80 per cent of the public money for energy research projects in the last 50 years went to nuclear energy. The result: only five per cent of the energy in the world comes from nuclear sources," says Hans-Josef Fell, a member of the German parliament from the Green Party. Between 1994-2001, more than US $72 billion was given to the coal sector in the European Union (EU). Germany, between 1970-2003, gave US $144 billion as subsidy for coal mining industry. Several tricks disguise subsidies to fossil fuels. Take for instance the energy legislation debated in the US last year. As per the US Congressional Budget Office (CBO), the draft 2003 energy bill would increase direct spending on energy by US $3.7 billion over 2004-2008 and by US $5.4 billion over 2004-2013. Revenues would be divided between electricity, coal, oil and natural gas production and nuclear power sectors. Only a very small share will be spent on renewables. The bill's drafters say all this is being done for energy security. Critics often ask where the money for 'expensive' renewable energy sources would come from. But supporters of renewable energy say it is just a matter of diverting money and not finding new finances. The World Energy Council, an international non-governmental organisation working on energy issues, estimates that diverting just one year of Europe's subsidy for fossil fuel and nuclear power (more than US $15 billion) could revolutionise the entire international solar energy industry, making it cost-competitive with traditional sources of energy. The US' National Renewable Energy Laboratory (NREL) says developing renewable energy in the country will just cost US $1.9 billion over 15 years, or on an average just US $100 million annually. OECD countries and their multilateral organisations keep alleging that developing countries account for the major share of the total energy subsidies given in the world, conveniently forgetting that the per capita energy subsidies given in OECD countries are much more than those given in non-OECD countries: The per capita energy subsidy in OECD countries between 1995-1998 was US $88, but in non-OECD countries it was US $35. The global average was US $44. The International Energy Agency (IEA) estimates that US $16 trillion will be invested worldwide in energy infrastructure during 2001-2030. About 60 per cent of this amount will be spent on electricity generation and distribution. According to IEA, more than half this investment will be required in developing countries. China will need 14 per cent of this investment (US $2.3 trillion), as will India, Indonesia and the rest of Asia. Of the total investments needed in electricity, 60 per cent will be required in transition economies and developing countries. It is imperative that a proportion of these projects be based on energy from renewable sources. World Energy Council research finds that money has to be invested in technologies like solar PV now, or they will get locked out in the future by fossil fuel technology. For every doubling of production in the solar energy sector, the price goes down by 20 per cent. So if we invest now, solar and fuel cells can become the world's chief electricity suppliers. What is the environmental and health cost of using fossil fuels? The case for renewable energy would have been strengthened if this cost, often called external cost, could be computed. Not much data was available on these external costs. Till now. Since 1991, researchers from EU and the US have been researching on the EXTERNE project, to quantify the socio-environmental costs of electricity production. It is one of the first projects to put plausible financial figures against damages resulting from different forms of electricity production for Europe. "Research has proven that the cost of producing electricity from coal or oil would double and the cost of electricity production from gas would increase by 30 per cent if external costs such as damage to the environment and health were considered. It is estimated that these costs amount up to 1-2 per cent of EU's gross domestic product, not including the cost of global warming. These costs have to be covered by society, since it is not included in the bills which electricity consumers pay" says a July 2001 EU press release. But these costs do not take into account the cost of global warming. In fact, the aggregate cost of road transport, the dominating source of damage, alone adds another 1-2 per cent of GDP to the bill. But if all costs were accounted for, the balance sheet would drastically change. It's estimated that the environmental cost for electricity from coal generation range from cent 2-15/ kilowatt hour (c/kWh; US $cent 2.4-18 per kWh); oil between cent 3-11 c/kWh (US $3.6-13.2 c/kWh and for gas cent 1-4 c/kWh (US $1.2-4.8 c/kWh). Given that the cost of electricity generation in EU is about 4 c/kWh (US $4.8c/kWh), with the addition of external costs, the actual cost for electricity from coal would come to about 13 /kWh (US $15.6/kWh). This is about 2.5 times higher than the current cost of generating energy from wind and only about half of that from some solar PV systems. The maths is clear. If environmental costs are considered and subsidies on fossil fuels removed, renewable technologies can compete with fossil fuel technologies. "Renewables are the second largest contributor to global electricity production. They accounted for 19 per cent of production in 2000, after coal (39 per cent) but ahead of nuclear (17 per cent), natural gas (17 per cent) and oil (8 per cent). Most of the electricity generated from renewables, however, comes from hydro power plants (92 per cent) followed by combustible renewables and waste (5 per cent). Geothermal, solar and wind accounted for less than 3 per cent in 2000," says the report. Due to high share of biomass in total renewables, non-OECD regions like Asia, Latin America and Africa are the main renewable users. OECD countries used 70 per cent of new renewables like wind and solar in 2000. Renewable energy can't become the world's powerhouse unless governments stop subsidising fossil fuels and promote policies that encourage investments in renewables. Governments across the world have been experimenting with various schemes to encourage renewables (see: The world: set to surge?). Germany's feed-in-tariff system increased the share of renewables in the country's total energy supply and decreased the cost of wind energy turbines. UK wasn't very successful when it first experimented with tenders, but it expects a lot from the new promotion system of renewable obligation. The experience of these two countries shows the intricacies of promoting renewable sources. Between March 30 and April 4, 2004, the German government took two completely opposite decisions regarding the energy sector. Following a European Union directive (2003/87/EC) on emissions trading, the German government on March 30 announced its 'national allocation programme' to reduce carbon dioxide emission. As part of this directive, member states had to submit national allocation plans detailing the carbon dioxide emissions targets they would achieve by 2007 and 2012. Germany's ministers fought hard: the economics minister wanted low reduction targets and the environment minister higher ones. Neither was willing to budge, and agreement was reached only after Chancellor Gerhard Schroeder intervened. Experts say this agreement is "not very ambitious": economics has won over environment. According to Germany's allocation plan, it will reduce emissions from the current 505 million tonnes of CO2 to 503 million tonnes by 2007 and 499 million tonnes by 2012. "This is a very bad plan. At times, the influence of coal lobby is amazing," says Danyel Reiche, of the Environment Policy Research Unit, Free University of Berlin. LAW, LOANS AND POLITICS: Germany started encouraging renewable energy in 1974, but it was in 1991 that it gave the sector the greatest push. In this year, the Act on Supplying Electricity from Renewables (Stromeinspeisegesetz, Str EG) came into force. This act "obliged public energy utilities to purchase and pay for electricity from solar and wind energy, hydropower, biomass, sewage and landfill gas on a yearly fixed basis," write Mischa Bechberger and Reiche of the Free University of Berlin in Renewable energy policy in Germany: pioneering and exemplary regulations, in the March 2004 issue of Energy for Sustainable Development. 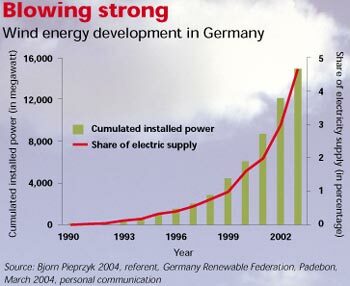 After Str EG was enforced, installed wind capacity in Germany grew almost a hundred times within a decade: from 48 megawatt (MW) in 1990 to 4,443 MW in 1999. The cost of producing electricity from wind technology today almost equals the actual cost paid for electricity. While on an average a fixed tariff of 7.5 cents/kWh (US $9 c/kWh) is paid to power from wind, the average industrial electricity price is about 6 cents/kWh (US $7.2 c/kWh). EEG, A CLASS ACT: The Renewable Energy Sources Act of 2000 (EEG) aimed to at least double the share of renewables in electricity generation by 2010 from the baseline year of 1997. This means that at least 12.5 per cent of electricity would come from renewable sources by 2012. Unlike the earlier feed-in system, EEG guaranteed a fixed, declining or regressive feed-in-tariff for all the electricity produced. The tariffs are guaranteed for 20 years and they reduce with each year. The tariff for biomass reduces by 1 per cent each year, for wind 1.5 per cent and for PV 5 per cent. This would mean that a PV plant set up in 2004 would get a 5 per cent lesser tariff than the one set up in 2003. According to EEG, a grid operator cannot say no to renewable energy producers and has to give renewables priority over other sources. The latest amendment to EEG encourages developing biomass-based renewable technologies (see: Farm to fleets: running on biogas in Germany). It gives a higher feed-in-tariff to biomass plants of lower installed capacity. The tariff keeps reducing as the plant size goes up. For example a plant less than or equal to 75 kilowatt installed capacity gets a feed-in-tariff of 12.5 cents/ kWh (US $15 c/kWh); while one of 5-20 megawatt gets 8.4 cents/kWh (US $10.1 c/kWh). The government pays no subsidy for the feed-in-tariff system; the extra cost is paid by the consumers. Certain energy intensive industries are exempted from paying the higher tariff under EEG. "As the electricity bill does not contain a break-up of the details -- electricity rate, distribution charges and money paid under EEG -- it is not very clear how much extra an average household pays for renewables. On an average it could be about 1 (US $1.2 /kWh) per month for a household," says Uwe Busgen of the Federal Environment ministry. "The electricity bill of an average household has increased by about 13 (US $15.6 /kWh) per annum because of higher tariffs paid under the EEG," informs Lutz Mez, deputy director at the Environment Policy Research Unit, Free University of Berlin. The electricity industry argues EEG is pushing prices too high. "Today the cost of supporting renewables comes to 0.46 cent/kWh (US $0.55 c /kWh), a total of 2 billion Euros (US $2.4 billion) per year. This is too much for the industry to pay. Households are already paying 40 per cent of their electricity bills as taxes. Can they afford the future increase?" asks Bohmer. The resentment is also due to fears that renewables will lead to job losses in the conventional energy sector. This despite data from the Federal Environment ministry that renewable energy has created 1,35,000 jobs in the country and recorded a turnover of 9.6 billion (US $11.5 billion)in 2002. But by 2003 UK had only 600-plus MW of installed wind energy. In 2002, 1.2 per cent of the primary energy and one per cent of the electricity in UK came from renenwables. "The promotion framework for renewables in UK did not meet with much success," says David Elliott, professor at the Energy and Environment Research Unit, The Open University, Milton Keynes, UK. "The country has taken a very soft approach," says Elliott. But things are looking up. "Reliance on abundant domestic energy resources has kept renewable energy in the background," writes Timothy P Brennand of the School of Environmental Sciences, University of East Anglia, UK, in the paper Renewable Energy in the United Kingdom: policies and prospects (March 2004 issue of Energy for Sustainable Development). "Now the prospect of exhausting indigenous fossil fuel is combining with heightening environmental awareness. Now is the time UK can benefit from the application of technologies such as wind-farming," writes Brennand. "The NFFO tendering system was good at giving contracts, but not at bringing actual finances into the renewables sector," says Marcus Rand, chief executive, British Wind Energy Association. The upside was that overall prices for renewables kept falling in different NFFO rounds: starting at about 5.5 pence/kWh (US $9.3 c/kWh) in the first round down to 2.7 pence/kWh (US $4.6 c/kWh) by the fifth round. Wind energy prices fell, from 6 pence/kWh (US $10.2 c/kWh) in 1991 to 2.5 about 2.5 pence/kWh (US $4.2 c/kWh) in 1998. NFFO also opened up the sector for investments. Now, NFFO has now been abandoned in favour of the renewable obligation. RENEWABLE ENERGY, BY OBLIGATION: In April 2002, UK introduced the renewable obligation (RO) scheme, which obliges a power supplier to derive an increasing percentage of electricity from renewables. Nationally, it was 3 three per cent in 2003 and 4.3 per cent in 2004, to be increased up to 10.4 per cent by 2010 and 15.4 in 2015. To prove their compliance, suppliers will have to provide RO certificates to UK's energy regulator OFGEM (The Office of Gas and Electricity Markets). RO certificates are like currency; one certificate equivalent to one MW of electricity supplied through renewable sources. Electricity suppliers can meet their obligation by either setting up their own generating capacity, or buying it from already existing plants, a step which will get them certificates equivalent to the amount of energy bought. They could also buy certificates from renewable energy generators. "Currently these certificates, called renewable obligation certificates, are traded at 35-45/MW (US $59.5-76.5/MW)," says Michael Cupit, assistant director, Energy, Chemicals and Utilities, Ernst and Young, London. "The actual cost of electricity from conventional sources like coal is about 18/MW (US $30.6/MW)," says Cupit. But what about other renewable technologies like solar energy? "Little money is being spent on solar energy because costs are high," says Catherine Murray, of the department of trade and industry. "We are obsessed with cheap energy. The government says that let us wait for the price of renewables technologies to come down. Most companies have stopped research and development on renewables," says Elliott. "The RO system has its own problems, like slow project financing. Uptake and development have been slow and in 2002-2003 compliance was only 48 per cent. The same is likely to be repeated in 2003-2004," says Cupit. According to the data from OFGEM on compliance in 2002-2003, "out of 38 supply companies in England and Wales, 12 met their obligation wholly through the production of certificates, and nine suppliers paid 100 per cent buy-out (30 per MW; US $51/MW). In Scotland, 28 suppliers had an obligation, of which 16 met their obligation wholly through producing ROCs, with four suppliers paying 100 per cent buy-out." For 2003-2004 the buy out price will be 30.51 (US $51.8/MW) per MW. Renewables obligation promotion system has made UK a promising market for renewable energy. Financial consultant group Ernst and Young has placed UK at number one in their latest 'Country Attractive Index' index for investments in wind energy sector. "In UK renewable energy is the only game in town. In the next five years 10-15 billion (US $17-25.5 billion) of new investment in the power sector will be in renewables and only 1.5-2 billion (US $2.5-3.4 billion) in fossil fuels," says Cupit. Much of the investment going into renewables is expected to be in offshore wind farms. "We could have a situation in 2010 where 70-80 per cent of the target of having 10.4 per cent of energy from renewables is met. This means that 7.5-8 per cent of the total electricity will actually come from renewables while the rest 2-2.5 per cent will met through buyouts or trading certificates," says Hartnell. 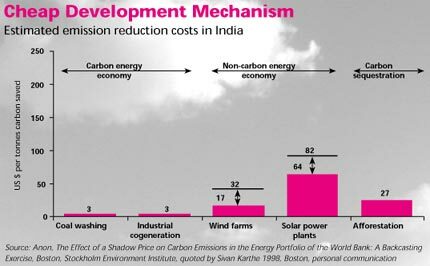 Starting before industrialised Germany and the UK, India has perhaps promoted renewables the longest though a dedicated establishment. The country's Ministry of Non-conventional Energy Sources (MNES) is one of its kind in the world. India has the fifth largest installed wind capacity in the world at 2400 MW. In 2003 alone, India added 615 MW of wind energy. By March 2003, it had 484 MW of installed biomass power/zcogeneration, 53 MW from biomass gasifiers and 2.5 MW of solar PVs. Installed capacity for all renewables by March 2004 was more than 4,600 MW. 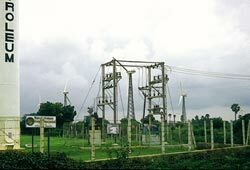 The Indian government wants to have 10 per cent of additional power capacity till 2012 through renewables. This means additional 10,000 MW from renewables. So what needs to be done? According to A M Gokhale, secretary, MNES wind energy is only a part of the solution. It is ideal for grid-connected power generation, but of no use to villages for it is intermittent, he says." "Only biomass-based technologies can ensure energy security in our villages. But it has been completely ignored," he adds (see interview: "We have completely ignored our biomass sector"). As India reforms its electricity sector for more renewable energy, the world is getting together on renewables. Literally. More than 1,000 delegates will gather at Bonn, Germany, for the International Conference for Renewable Energies (Renewables 2004) in June at Bonn. It is being organised by the government of Germany, which along with the EU is a strong votary of globally-binding targets for renewables. But developing countries may not want that. As Gokhale puts it, "We do not agree with them: They cannot dictate targets and time periods to us." At Renewables 2004 "an international action plan will be on the agenda, including actions and commitments by governments, international organisations and stakeholders," says the conference announcement document. "The conference outcome will include arrangements for a follow-up and a mechanism to share information on progress in implementing the international action plan." But the big question is: Will the conference weaken the fight against climate change? Or will it provide the Kyoto Protocol -- the legal instrument to limit greenhouse gases now bottled up by the obduracy of rich nations -- the necessary push? That renewable energy can help in fighting climate change is indisputable. But even as the US and Russia have derailed the Kyoto Protocol, the EU's insistence on national targets for renewables is seen by developing countries as a new 'conditionality' on the development process. Moreover, concerned civil society organisations, helpless against their own governments and worried about this trend, have turned on the pressure on the multilateral system -- the World Bank and such-like -- to stop financing fossil fuel energy projects. They argue that these funds are used to invest in polluting energy sources and want the banks to fund only renewable-based projects in developing countries. However, besides the sheer immorality of this arm-twisting, which shifts the burden of change from the rich to the poor nations, the groups fail to explain who indeed will pay for the higher costs of this transition (see: Does the end justify the means? ).